Home › Best Place to Grab a Drink ›	What, Exactly, is Bourbon – and Why Does Most of it Come from Kentucky? Have a conversation with Tim Knittel about the origins of Kentucky bourbon and why most of the world’s bourbon supply (but not all!) comes from here. A conversation between you (the reader) and Tim Knittel. Tim: “Bourbon whiskey is a type of whiskey. There are actually lots of types of whiskey: Scotch, Irish Whiskey, Canadian Whisky and many more. Each of those has their own specific requirements within the process of making whiskey. “For bourbon, at the beginning of the process the grains must contain a minimum of 51% corn. Typically, a bourbon distiller will also use malted barley and either wheat or rye for additional flavor. Tim: “Good. Next, the grain spirit is reduced to 125 proof or less using nothing but pure water. Then, the grain spirit is matured in an oak container (currently always a barrel but the law says container) like all whiskeys are ­but for bourbon the barrel must be new and charred. “New is straight­forward: the oak barrel must not have previously held anything. Charred means the barrel is literally set on fire and burned on the inside to create a layer of oak char. “Charring the barrel breaks down some of the molecules in the wood into alcohol­ and water-soluble compounds which are extracted by the liquid. This is where bourbon gets its distinctive amber color and much of its flavor. 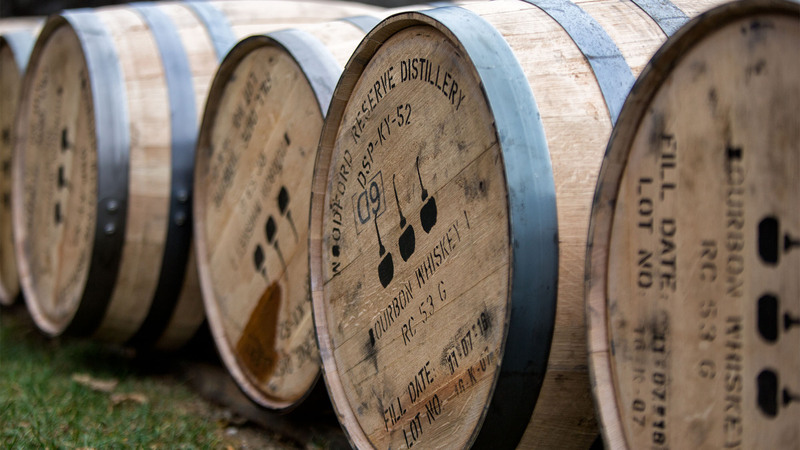 Usually about 60­80% of the flavor of bourbon comes from the barrel. Tim: “Yeah ­the ‘e’ issue. “‘Whiskey’ can be spelled with or without the ‘e.’ There’s not much rhyme or reason to it. A general rule of thumb is that countries with an ‘e’ in their name (United States, Ireland) include the ‘e’ in whiskey and those without (Scotland, Canada), omit the ‘e.’ But it’s not hard and fast – there are plenty of examples to the contrary. So it just depends on who’s writing the word. …And why does most of it come from Kentucky? Q: Wait ­most? I thought all bourbon came from Kentucky. A: That’s a common misconception. (Maybe not a bad one!) Bourbon can be made anywhere in the United States. But Kentucky makes 95% of the world’s bourbon supply, so there’s a good reason most people associate the two. Great question. The answer is part history, part geography. Fermenting grains into mash and distilling the liquid into spirit began in the 1400s or 1500s in present­day Scotland. This process came with the settlers to the New World. In the early days of the United States, farmer­distillers were numerous and a source of revenue for the newly formed government. The whiskey tax (among other things) drove these farmers into the then­unsettled lands of Kentucky (and Tennessee). This new location caused two changes to the whiskey recipe. First, the farmers shifted from barley or rye to corn as the base grain. Corn thrives in Kentucky’s hot summer where barley and rye prefer a cooler climate. Second, this new ‘corn liquor’ needed to get to the marketplace ­all the way down in Louisiana. For short distances (say, from the distiller next door to your kitchen) a jug or jar is fine. But for long distances, the only container to use is a barrel. Oak barrels had been used for millennia for transporting liquids and Kentucky was (and still is) dense with oak trees. So barrels were made, filled with corn liquor and floated down the Mississippi river on flatboats. And here a miraculous change occurred: the liquid went into the barrel clear but after months (or years if the final destination was back up in New England) sometimes the liquid came out with an amber hue and a delicious sweet vanilla flavor. This transformation was inconsistent at the beginning until it was discovered that charring the barrel literally setting the inside on fire and letting the wood burn­ changed the oak in a way that allowed the liquor to extract its sweet character. Through the 1800s the process of making bourbon became more precise and scientific and by the end of the century – a mere hundred years after the founding of the United States – the bourbon industry was well established with most major players centered around either central Kentucky or in the north­west part of the state near Louisville. Here they had a temperate (but not too temperate) climate for growing corn, easy access to ample oak and an abundance of clean limestone water – all the building blocks of great bourbon. Also, a new piece of the process had been added: intentional barrel maturation. Instead of relying on the travel time for maturation, barrels of bourbon were ricked in great barrel warehouses strewn throughout the state. Then in 1870, George Garvin Brown introduced the Old Forester bourbon brand which he offered exclusively in bottles – this allowed him to select only the barrels which had reached maturity and control quality and flavor. Soon, most bourbons had followed suit. This was the first golden age of bourbon. But then came prohibition, the Great Depression and two world wars which nearly wiped the bourbon industry out. During this time, the popularity of bourbon grew to such heights that many new distillers started production all around the United States and existing distilleries laid down unprecedented numbers of barrels. The combination of oversupply and a sudden swing to vodka, gin and light beer as the American beverages of choice caused the bourbon industry to collapse. Over the following several decades distilleries around the country scaled back, consolidated production or closed outright. Bourbons developed a reputation as harsh, bottom­shelf spirits. The bourbon distilleries that survived this downturn were the Kentucky ones – Buffalo Trace, Jim Beam, Heaven Hill, Four Roses, Wild Turkey and the Brown­Forman Distillery in Louisville. Then, in the late 1990s, a new style of bourbon emerged – premium, small­batch and higher­priced. This included the Russell’s Reserve brand of Wild Turkey, the Jim Beam small batch collection of Knob Creek, Booker’s, Basil Hayden’s and Baker’s plus the creation of an entirely new bourbon named for the distillery’s location in Woodford County right in the heart of the Bluegrass region, among others. The fickle thing that is the American palate swung back from light and artificially flavored alcoholic beverages to hand­crafted, naturally flavorful and complex spirits. And the distilleries opened their doors to a new type of tourist the bourbon tourist. And now we are living in the third golden age of bourbon. Today you can visit the bourbon distilleries and learn about their rich histories, the scientific way they craft their spirits and even pick up special bottlings from their gift shops. There are two bourbon trails to take – the primary (called Heritage) KY Bourbon Trail® and the KY Bourbon Trail Craft Tour® experiences. Or you can visit a mix of the two and intersperse a few thoroughbred farm visits along your way. For an amazing exploration of the science of bourbon making, take the ‘Corn to Cork’ tour at the Woodford Reserve Distillery. Reservations are required. Tim Knittel is owner of Distilled Living, a bourbon education and specialty events company. 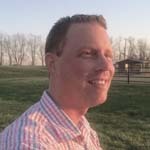 He is a former bourbon industry insider with more than seven years in the industry, including as the culinary center general manager and specialty bourbon educator for the Woodford Reserve Distillery. He is also an Executive Bourbon Steward (often compared to a Bourbon Sommelier) which is the highest certification for a bourbon education professional.